Although rugged devices are often priced a little higher than consumer devices, rugged devices have been gaining popularity over their reliability and durability as had been explored here. Such an increase in popularity often attracts an increase in production which also increases the chances of producing defective rugged devices. IP67 and IP68 are primarily ratings that have emerged to help us estimate the ruggedness of rugged devices. The terms IP67, IP68 (and at times IPX7) have been gaining popularity lately as measures for electronic device ruggedness. Because the terms are still fairly new to the market, not many people seem to comprehend the essence of these ratings. Perhaps you too could be wondering like: What do these terms stand for even? Could it be something utilitarian or just a “sale-quick” marketing phrase? How can the so-called “IP-Rating” become relevant when purchasing a rugged device? And, how can the IP ratings guide me to choose the best-rugged device for my job? Mmmh… So, what is an “IP Rating”, and how is it important? International Protection Rating (also known as Ingression Protection) Rating (IP) is a term that was coined by the International Electrotechnical Commission (IEC) as a standard for classifying the measure of protection given to electrical enclosures against the intrusion of solid objects, dust, water and accidental contacts. The IP standards were defined under the 60529 IEC standards that were amended in 2013 and 2015 as a way to classify and grade designs by manufacturers when producing durable devices aimed at durability. It equips consumers with more accurate information on electronics than the normal marketing terms. The second digit on the rating takes values that range between 0 and 8. 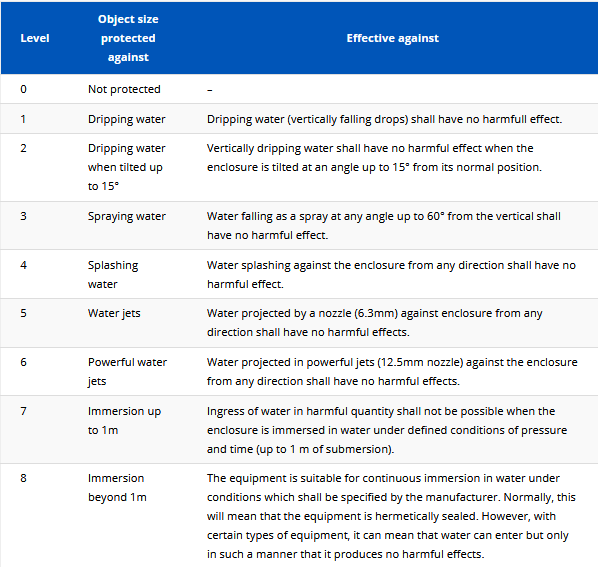 These second values denote the degree of protection given to electrical and electronic devices against harmful ingression of water. They are graded as shown in table 2 below. These values give a reliable measure that can help one to cut through the marketing phrases like “waterproof” to ascertain the actual, tested durability of a device. Water-resistant ≠ Waterproof: Being “water-resistant” (as used in the IP grading) does not equal “waterproof” as used by sales and marketers. With the IP grade rating, you can estimate the tolerance of your rugged device’s casing towards accidents that might occur in real-world environments. Also, since the devices are not waterproof, the rating also warns one against exposing the IP rated devices to extreme conditions that might result in their malfunctioning. The water used for testing is clean and distilled water. The water used for laboratory testing of devices with IP ratings is clean distilled water with no impurities. This means the ratings could vary if devices that are tested on normal working environments with different types of liquids. How is knowing IP rating relevant when buying a rugged device? Estimate the ruggedness of a device’s casing. I.e., the IP grading attempts to quantify the limits that a device can attain when treated under extreme conditions. This makes the grading to be reliable and honest than a pure rating based on sales-driven descriptions. Estimate the appropriate budget for a rugged device. In that, knowing that a device has been certified to be durable and tolerant to accidents could also influence your willingness to spend when buying a gadget. It will guide you to acquire devices that will be worth their cost. That is, cheaper if they are not very durable and a little costly if they are extremely rugged. How do I determine the best IP grade for my rugged device? How often will I use the rugged device? This question seeks to determine the frequency of one’s access to the rugged device. If one uses the rugged device often, it could mean that any hindrance to the device could directly affect one’s operations. As such, it could be important to consider buying IP68 as opposed to IP67. What is the nature of my working environment? Here one might opt to consider a few factors like the availability of moisture, water or dust in one’s operating space. In case one operates in areas like dusty roads or carpentry workshops with dust, it could be okay to go for IP67 and IP68. But it will be inappropriate to buy IPX7 as its measure of sustaining dust is undetermined. How much am I willing to spend?The cost is crucial when buying electrical and electronic devices. Thus, after one determines the appropriate ruggedness specifications for his/her preferred device, it could also be very important to ascertain one’s ability to buy the device. By balancing the three specifications, one can purchase an affordable and rugged device that conforms to the IP standards.